This article orginally appeared on ForeignPolicy.com. I read two critically important reports this week on the impact that sequestration would have on national defense. That possible reduction in military spending -- $48 billion, or 7.4 percent of the $645 billion currently appropriated for fiscal year 2013 -- is being characterized by the stampede of hysterics who run the Pentagon as the virtual end of national security as we know it. What these two reports show is that we should now consider the Pentagon as morally and mentally broken as Congress. The first report, by Chuck Spinney, who spent a few decades inside the Department of Defense evaluating budgets, weapons, and bureaucratic behavior, was published at Counterpunch and Time's Battleland blog. The second was a Congressional Research Service report by Amy Belasco, who has spent the last few decades at CRS and the Congressional Budget Office parsing defense budgets and their implications. Both authors indirectly address the testimony this week of the deputy secretary of defense and the entire Joint Chiefs of Staff at the House and Senate Armed Services Committees. To a man, they lent all the rhetorical and substantive support they could muster to Secretary of Defense Leon Panetta's depiction of sequestration as "doomsday" and to Chairman of the Joint Chiefs of Staff Gen. Martin Dempsey's description of it as an "unprecedented crisis" -- a characterization he augmented by adding that he was "jumping up and down." He truly was. Put simply, the chiefs and their ostensible civilian masters plan to implement the cuts mandated by law in the most destructive, negative way possible, which has the convenient effect -- for them -- of pushing Congress and the White House to cough up more money. According to their testimony, the Army will reduce training levels to such a low point that units cannot be sent to Afghanistan. The Navy plans to postpone, if not cancel, maintenance for ships in a fleet already at historic lows for upkeep and repair, and deployments to the Persian Gulf have already been postponed. The Air Force is going to further reduce its historically low training of pilots, and maintenance will also hit new lows. Throughout the services, civilian maintainers, auditors, and program overseers will be furloughed, aircraft will be grounded, and ships held in port. However, there is no reason for this to be so. Had Spinney and Belasco also been testifying at these hearings -- had anyone in the committees been even slightly interested in a little balance or a few budget facts with cogent historic and objective perspective -- the chiefs would probably have experienced a bureaucratic form of post-traumatic stress disorder. For its part, Belasco's CRS report looks into the weeds of sequestration and finds that the chiefs are proposing to cut about twice as much as they need to from the central military readiness account in the operations and maintenance part of the Pentagon budget. They plan to lop off 20 percent, instead of the 10 to 12 percent that they could limit themselves to. They could be obviating many of those horrendous readiness cuts by hitting up less readiness-critical operations and maintenance accounts. But, of course, they chose not to. And -- not coincidentally I suspect -- after all the cutting is done as planned, the chiefs will find themselves with even more money than they requested for some of their favorite hardware items. After the sequester has taken a cut out of the Pentagon's (separate and legally distinct) procurement account, the Air Force funding for aircraft will increase by $829 million; Navy shipbuilding will have $155 million more than requested for 2013 waiting to be spent, and the weapons and tracked combat vehicles account in the Army budget will have $404 million too much. 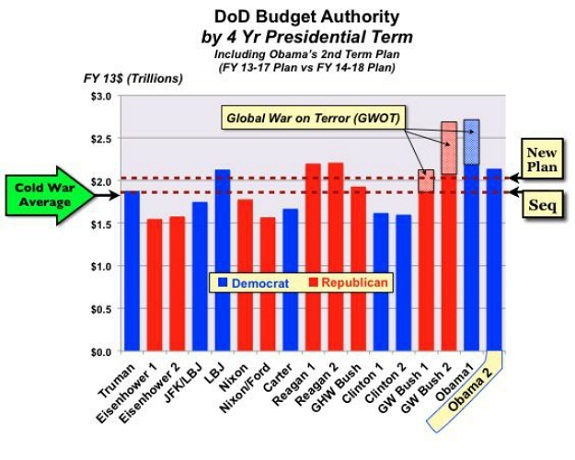 Only in the collective of mindlessly selfish and careerist politicos in today's Congress and Pentagon "leadership" can a budget doomsday result in more than was asked for in certain -- apparently covertly preferred -- categories. It's quite staggering, but it's laid out explicitly in Belasco's report. Deputy Secretary of Defense Ashton Cater put the cherry on top of this pile of absurdity when he testified that, when he was offered the flexibility to cut where he deemed appropriate (rather than the across-the-board cuts mandated by Congress), he actually declined. Today, Congress professes itself all too eager to fall for the ruse. At the hearings this week, members railed on about the stupidity of the laws the vast majority of them voted to enact; several of them even purported that it was all the Pentagon's fault, which didn't exactly go over well with the money-grubbing Joint Chiefs. The irony, however, is that the rancor, self-aggrandizement, and cowardice that dominates so thoroughly in Congress means that the dreaded sequester is almost sure to take place on March 1. While both parties in both the House and the Senate have prepared bills to divert it, each side has -- very consciously -- written legislation that they know the other side will enthusiastically reject: The Democrats want tax increases to pay off the sequester; the Republicans want to decimate the federal work force. More intended for fund-raising and election-maneuvering, the bills were not just dead on arrival; they were dead in procreation. Thus, we have a freakishly large budget being characterized by the Pentagon's military and civilian leadership as so small that they must literally destroy the armed forces' ability to fight. We have a Congress of Republicans and Democrats who declare themselves near universally dedicated to fixing the problem -- with more money -- while at the same time they work feverishly to make sure nothing happens. And just to reinforce just how serious they are, their action in the immediate aftermath of the hearings is to go on vacation for a week. The biggest loser -- and fall guy -- in all of this is Chuck Hagel, who is anxiously trying to squeak by in his effort to replace Leon Panetta as secretary of defense. It comes after a profoundly depressing performance in his confirmation hearing, at which he inarticulately but effectively ate his own words on issue after issue in order to curry favor with even the most junior member of the Armed Services Committee. Eschewing also the opportunity to inject badly needed insight, information, and spine into the budget situation, Hagel also pandered eagerly to conventional wisdom, calling the sequester a "straightjacket" that would "devastate" the military and require DOD to "significantly revise the defense strategy." In the final analysis, Congress will do something to accommodate the budget protection gambit being performed by the real masters of the Pentagon, the Joint Chiefs of Staff. Meanwhile, the new secretary of defense, who has pre-emptively capitulated to the chiefs' budget fancies, as he has to everyone else, has made it abundantly clear that he will sit on his hands as the Pentagon decimates military readiness. Chuck Spinney has tracked for decades our military forces as they have shriveled -- counter-intuitively -- at ever-increasing cost, and Amy Belasco has reported to Congress time and time again opportunities for doing things smart, not ugly. Both will be foregone for the easier and politically remunerative way the current system prefers to do things: stupid, crooked, and ever-so expensive.